participating in this giveaway!By following us on our social networks and by email we are able to get the best giveaways together on the internet! Please take a minute to “like” us on Facebook! Thank you!Chances of winning depend on entries received. Because of their vision to become the premier online electronics seller by providing an unparalleled selection of the very best gadgets, an unbeatable shopping experience, prompt shipping and exceptional customer service GearBest provides some of my favorite products that I have in my life. 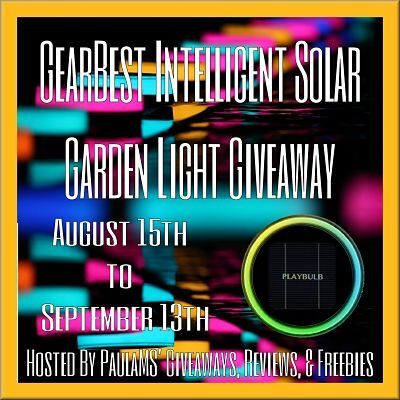 I have come to expect quality, service, and the most up to date options from each and everyone of their products that I receive.One of their newest products the PLAYBULB garden is a smart RGB color LED solar garden light with built-in sensor that detects the lighting condition and automatically turns on or off. Take it where ever you go and with the PLAYBULB X free App, you can change the lighting mood of your environment at the tap of a finger. Visit their website to learn more about their creative lighting line. I am so excited about these lights. I love them so much!!! I am in love with these lights. They are so pretty and I love that they are solar. Makes it so much easier than having to wire or keep up with batteries. I would love to have one of these lights to illuminate my flower garden. It would be so pretty!